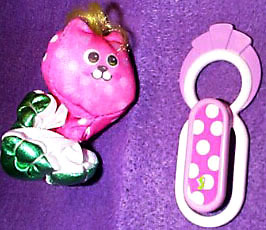 Description: This set includes a plastic clip and a Smooshee cat that can be smooshed into the end of the clip. Designed for children ages 4 years and older. FPT16335 - Dottie Kitten - Small cloth stuffed Smooshee cat with a printed face and other features. Dottie is pink with white polka-dots on her body and purple polka-dots on her face. She has white legs and green metallic pads on the bottom of her feet. She has a long strand of yellow hair on top of her head. FPT16336 - Light purple and white plastic clip (resembles a paper clip) with an attached loop on the end that a Smooshee can be smooshed into. The clip has a hot pink oval-shaped paper litho with white polka-dots on the top. Measures 3-1/4" tall, 1-3/8" wide. FP7301BOX1989 (Box ONLY) - Sold in a 6-3/8" long, 9-1/4" high, 2-9/16" deep display box. FP7301SET1989 - Complete set in original box. WFL: 07-AN-01-5-E.
Also sold in #7300 Smuggler Clip-Ons.